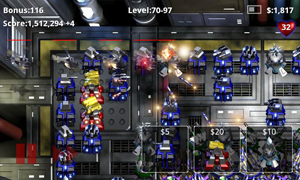 Robo Defense is a new game available in the Android App market that has received rave reviews. It is a game based on defense strategy featuring a variety of different maps. The user has to figure out a way to get their team safely through the maps by strategically placing defense towers. The app is loaded with phenomenal graphics however they have proven to make the game run at a slower pace. If the game is running a little more slowly than it should, turn off the option for high quality graphics and the game should run faster. The features on the full version include five different maps as well as a variety of difficulty levels. The last update on the app was made on March 8, 2011 and the glitches that have been found are still being worked on. The program is 2.99 to purchase and already has over 500,000 downloads.